We’d love your help. 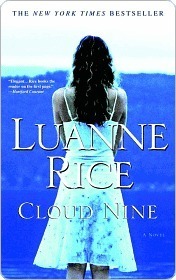 Let us know what’s wrong with this preview of Cloud Nine by Luanne Rice. What would you do with a second chance at life? Sarah Talbot thought she’d never see another birthday. But against all odds, she beat the illness that could have killed her, reopened her bedding shop, Cloud Nine, and vowed to make the most of a fresh start that few are given. With Thanksgiving approaching, Sarah charters a small plane to take her to Elk Island, a remote spo What would you do with a second chance at life? Sarah Talbot thought she’d never see another birthday. But against all odds, she beat the illness that could have killed her, reopened her bedding shop, Cloud Nine, and vowed to make the most of a fresh start that few are given. With Thanksgiving approaching, Sarah charters a small plane to take her to Elk Island, a remote spot off the rugged Maine coast where she spent some of her happiest days and where she hopes to reunite with the two most important people in her life. She arrives on the island with pilot Will Burke, a kindred spirit with whom Sarah forges a bond that will give them the courage to confront the past and have faith in the future…no matter how uncertain. Once Sarah thought happy endings occurred only in books; now she believes they can happen for anyone. And as she and Will grow closer, and something unexpectedly real blossoms between them, she has him believing it, too. But is believing it enough? Is even love enough? Can real life be lived on cloud nine? In this stunning novel, New York Times bestselling author Luanne Rice tells a story you will cherish, peopled with indelible characters whose challenges are your own. This book made me put it down and just sob. What a heart touching story and a must read. One of my favorite Louanne Rice books. The best word I can think of to describe this novel is “lovely.” Full of emotion, it’s the story of two people who find each other at a time in their lives when they are ready to be healed from the past and move forward in a relationship that is full of love and endless possibilities for happiness. Several times, this book brought tears to my eyes. As I came to adore these characters, I found it more and more difficult to put it down. I wanted so much for them to find what they were looking for i The best word I can think of to describe this novel is “lovely.” Full of emotion, it’s the story of two people who find each other at a time in their lives when they are ready to be healed from the past and move forward in a relationship that is full of love and endless possibilities for happiness. Several times, this book brought tears to my eyes. As I came to adore these characters, I found it more and more difficult to put it down. I wanted so much for them to find what they were looking for in each other. This is one of Luanne Rice’s older novels, published in 1999. She is such an excellent writer and a master storyteller. I’ve read several of her books and have never been disappointed. This is probably one of my favorites by her and it will have a special spot on my bookshelves. If you haven’t read any of her books, Cloud Nine would be a good one to start with. Very touching and endearing, it’s unforgettable. This is the kind of book that my friends and I affectionately refer to as a "suicide book" - i.e. really sad. It might be an awful term to use when describing something...but this one definitely fits the bill. I started reading this book several months ago, and for some reason I put it down. I only picked it up again the other day because I really wanted to finish it, even though I was pretty sure of what was going to happen to the main characters. I sobbed vehemetly for the last twenty pages or This is the kind of book that my friends and I affectionately refer to as a "suicide book" - i.e. really sad. It might be an awful term to use when describing something...but this one definitely fits the bill. I started reading this book several months ago, and for some reason I put it down. I only picked it up again the other day because I really wanted to finish it, even though I was pretty sure of what was going to happen to the main characters. I sobbed vehemetly for the last twenty pages or so, even though I had the entire book to prepare myself for what was to come. With all the flaws that I found in the book, I still really liked it. Sometimes I didn't like the main characters - I found Sarah, the main character, downright annoying at times. I adored Snow, and found her grief with loosing her brother very real and touching. I even adored George, Sarah's father - in the end, it came down to him facing his worth fears. YECH! Sappy, trite dialogue plus flat, emotionless characters plus stereotypes galore equals CLOUD NINE. I couldn't get through this one. It felt too much like a "bodice-buster" paperback romance. Advice to all: AVOID LUANNE RICE. I don't know that this deserves a 5 star rating, but it was definitely the right book at the right time for me. I fell in love with Susan/September/Secret/Snow/Sarah. Also, the portrayal of being a mother and wanting her son to find the right path really hit home for me. The need for people to say good bye still brings tears to my eyes. I think this is a book that is perfect when you need a good cry. This book was a great read, a real dose of reality for those who have never lost a love one to a disease...........great characters, love lost, love found, the Heroine reminds me of a dear friend who recently passed away at the same age of the same disease. But my friend left her son, a little boy ...............a must read, yes it's a bit sad, but it will give you strenght and understanding. It was alright. I had trouble with the storyline. It was hard to suspend my disbelief. The author has moments of wonderful description. I did like the setting and emotion tied to the locations. I couldn't relate to the characters. This will probably be the last I read by this author. Luanne Rice's books are better when she adds hard situations. This one has a main character battling cancer. I find her books which only deal with romance/relationships rather dull. I cried with this one. I would do 4.5 stars for the simple fact that I did not love the way the characters were introduced. But other then that I loved this book. A super easy read. Luanne really makes your feel like you're part of the story.I really enjoyed this book, and would recommend it! This review has been hidden because it contains spoilers. To view it, click here. Oh my God! This book, I know that everything went okay after Sarah's death but this is the first book of Luanne Rice that I've been reading, where one of the main characters died. Such a tragedy, very heartbreaking. The feeling of surviving from a very complicated disease then after some peace here it goes again, coming back. Sarah she was a very strong woman, taking and accepting everything. While I'm reading it, even it's not possible I was actually thinking of Sarah getting cured, like a mira Oh my God! This book, I know that everything went okay after Sarah's death but this is the first book of Luanne Rice that I've been reading, where one of the main characters died. Such a tragedy, very heartbreaking. The feeling of surviving from a very complicated disease then after some peace here it goes again, coming back. Sarah she was a very strong woman, taking and accepting everything. While I'm reading it, even it's not possible I was actually thinking of Sarah getting cured, like a miracle or something will happen and they, with Will, Susan, and Mike will happily at Elk Island. This is one of my top books that I love of Luanne Rice. She is such an amazing writer, with insight to the heart and soul, also with touches of magic in-between. This review has been hidden because it contains spoilers. To view it, click here. I enjoyed reading this book because reading about a dseased person showed me that it doesnt matter who u are anyone can get diseases. sarah was one of the lucky ones who survived. Really well written and interesting but way too sad for my taste. É um dos melhores da autora, triste mas sem dúvida um livro muito bom! I just finished this book. The characters are still with me. Lou Anne Rice did a wonderful job of creating characters that became my friends. A wonderful read! The author has projected the characters and emotions in such a beautiful manner. tweede keer dat ik het boek lees. eerste keer was 10jaar geleden. En nu raakte het me net zoveel als toen. This is my second Luanne Rice book. What a great author! I will be reading more of her books as time goes on. This book is well written with great characters, but a caution to readers, it is really sad. Sarah, Will, Alice, Michael, Susan (Will and Alice's teenage daughter) and even the weird step father Julian are all complicated and sophisticated characters. This is set in Maine mostly on Elk Island which is cut off from civilization. Sarah's father George, a widower and her Aunt Bess, a widow This is my second Luanne Rice book. What a great author! I will be reading more of her books as time goes on. This book is well written with great characters, but a caution to readers, it is really sad. Sarah, Will, Alice, Michael, Susan (Will and Alice's teenage daughter) and even the weird step father Julian are all complicated and sophisticated characters. This is set in Maine mostly on Elk Island which is cut off from civilization. Sarah's father George, a widower and her Aunt Bess, a widow run the family farm and provide down quilts to Sarah's shop in Upper State New York where Sarah needed to go to in her youth. George and Bess give a home to single parent Sarah's son Michael, who flees Sarah's home in his own youthful rebellion to discover his roots on Elk Island. Susan, the teenager, is a wonderful character who has a lot of wit and wisdom for her age. Sarah did leave the island and her beloved ocean, but her two homecomings are a time for her to correct past misunderstandings, discover who she is and gain peace for herself and with her father and her son. Although this is sad, there is so much love and hope in this book that is well worth reading if you are prepared to meditate on love and loss and life altering changes. "La Novena Nube" es uno de esos libros que son tan románticos que hacen que te sientas como una completa enamorada. Es un libro que a pesar de ser muy corto, puedes encontrar en sus personajes y en su historia muchos mensajes que te harán reflexionar sobre la forma en que vemos la vida. Uno muy claro es la actitud de la protagonista Sarah ante todos sus conflictos y problemas tanto físicos como emocionales, les juro que como me gustaria poder sonreír como hace ella siempre en todo momento, es mu "La Novena Nube" es uno de esos libros que son tan románticos que hacen que te sientas como una completa enamorada. Es un libro que a pesar de ser muy corto, puedes encontrar en sus personajes y en su historia muchos mensajes que te harán reflexionar sobre la forma en que vemos la vida. Uno muy claro es la actitud de la protagonista Sarah ante todos sus conflictos y problemas tanto físicos como emocionales, les juro que como me gustaria poder sonreír como hace ella siempre en todo momento, es muy inspirador. Sin embargo mi personaje favorito fue Susan/ Secret/ Snow (cuando lean el libro entenderán porque). This book was beautifully written--a truly beautiful story of love in all of its variations. But it was also devestatingly sad. The book couldn't have ended any other way, but that doesn't mean I didn't sob for the latter 100 pages and wish like crazy things could've been different. Enjoyed this story, especially because of some of the local area referrals, which I am familiar with. Unfortunately, about 3/4 of the book, you do realize how it was going to end. That being said, I have read many Luanne Rice books and have been very please with all of them. Drug store stuff but good enough to keep reading. Love Luanne Rice and her books. This one is kind of like a fairytale. And as always, I cried. I like Luanne Rice's books but this one, I had to stop reading. More than one reason - had a feeling I knew where story was going. Characters were smarmy and stereotypical yuppies. Luanne Rice is the New York Times bestselling author of thirty-two novels including THE SECRET LANGUAGE OF SISTERS, her first YA novel. Five of her books have been made into movies and mini-series, many have been New York Times bestsellers and two of her pieces have been featured in off-Broadway theatre productions. She divides her time between New York City and the Connecticut shoreline.